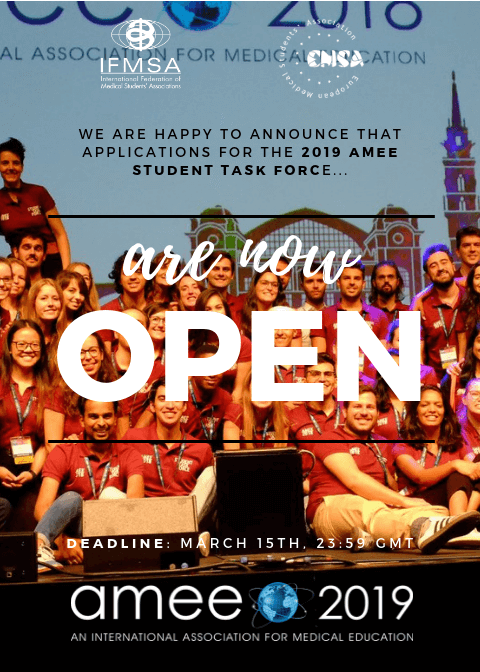 Background: Applications for the AMEE Conference 2019 Student Task Force are now open! Information summary: The AMEE Student Taskforce comprises of over 40 international students who participate and assist in the AMEE Conference, the biggest Health Profession’s Education Conference annually. All health professions’ students are welcome! The conference will take place between 24-28 of August. Working days: 22-29 of August. Read the application tips document and the FAQ guide. Take the plunge and apply!